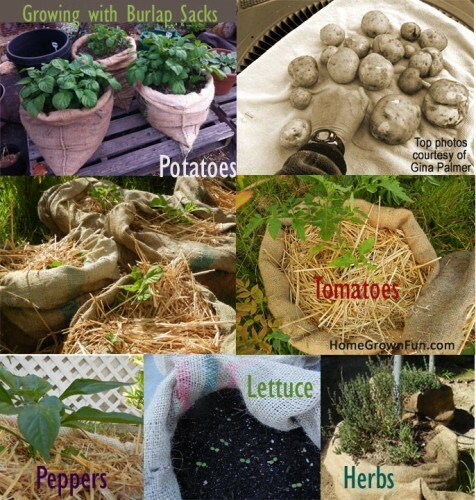 When you run out of garden space or you want to try something new, consider the burlap sack. These recycled coffee sacks will probably last one season but they can be plopped down anywhere and blend naturally into your surroundings. We’re growing herbs, lettuce, peppers, tomatoes and potatoes. Lay them down, close them up after filling with soil and cut holes to fit your plants. Or use them upright like we did. ~ Burlap/jute/sisal is a biodegradable material. It will rot out on the bottom after a month or two. Position your bags where you want them from the beginning to avoid what we call “sack the ripper”! ~ Sacks lend a soft touch to the landscape and work well in groupings. Maybe tie a piece of rope around the top to give it a cinched look. ~ Bee keepers love using jute. They burn the material to produce a long lasting and mesmerizing smoke to calm the bees. ~ Red wigglers like living around the jute and will actually break it down for you. Use it in your worm bins – shredded for efficiency. We also use a strip of it over our bedding in the bin to prevent fruit flies. ~ Control weeds by laying the burlap on top of problem areas. Add layers of newspaper underneath to prevent growth. ~ Store dry materials in the sacks but make sure not to create a home for unwanted animals. ~ Dogs like to lay on the burlap and we found that many coffee roasters in San Diego are now donating their bags to the Wild Animal Park to use for animal play, bedding and more. Do you have any other ideas or uses for burlap in and around the garden? LInking to this post on my blog juliecache.com Thanks!